I absolutely love aubergines. I’m sure I’ve mentioned this before. Their flesh has an almost potato like texture, which is pleasant since I no longer eat normal potatoes because of the starch and its effect on insulin levels, and they soak up so much flavour. I never seem to gain weight when I eat them, something a friend of mine was discussing with me after I passed on my aubergine bug to him. Oh before I post it, I must add, Ottolenghi’s directions for roasting aubergines always seem to be written with non-fan ovens in mind. If you have a fan oven, you only need to put the aubergines in at about 180 degrees and for half an hour, rather than the 40 minutes he states, otherwise they’ll end up charred and acrid. So I made this meal in the festive season between Christmas and New Year. It is perhaps the most popular dish of increasingly reknowned chef Yotam Ottolengh’s, judging from the ‘buzz’ being created by it online. 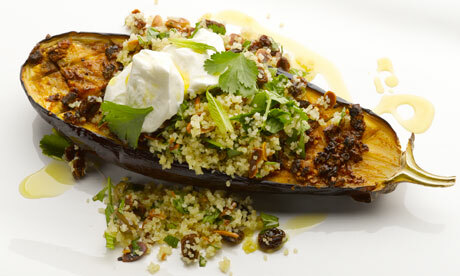 Served separately, both the aubergine and the bulgar salad from this dish are delicious with the accompanying Greek yoghurt, but all three together are a match made in food heaven. Chermoula is a potent North African spice paste that is ideal for smearing on your favourite vegetables for roasting. Serves four as a main course. Preheat the oven to 180C/350F/gas mark 4. To make the chermoula, mix together the garlic, cumin, coriander, chilli, paprika, preserved lemon, two-thirds of the olive oil and half a teaspoon of salt. Meanwhile, place the bulgar in a large bowl and cover with 140ml boiling water. Soak the sultanas in 50ml of warm water for 10 minutes, then drain and add to the bulgar, along with the remaining oil. Stir in the herbs, olives, almonds, spring onions, lemon juice and salt, taste and add more salt, if necessary. What I do is then add the ingredients he adds to the bulgar wheat, to add even more flavour. So, yes, it’s quite an undertaking, cooking all this in its entirity, however it is very much how I imagine the food of gods must taste.